"The idea is to give her as much practise as possible in the saddle in the coming months. She has already made a decent start on the flat with the help of Lawney Hill, is keen to progress and is definitely going the right way." With the ground drying up everywhere and no sign of any significant rain we have only two runners this weekend. It is not too frustrating at this early stage of the season as I'd say our horses are still a fortnight away from where I want them to be in terms of fitness. We did have four winners last weekend, although some horses needed the outing, others had issues and a few were simply not good enough. The plan has always been to have them ready for the start of November, just like last year when we struck form with a vengeance. We are pressing on with the team who are doing plenty of work, but I don't want to race them on watered ground. It was a pleasure to have the dual Olympic gold medallist Victoria Pendleton schooling for us on Thursday morning even though she and Ceasar Milan almost bowled me over when the horse ducked out at one of the fences without a moment's warning! I dived one way and luckily Ceasar Milan sped the other way. If I'd moved in the opposite direction they would have charged straight into me and there are no prizes for guessing who would have come off second best. Everyone watching the drama unfold at our outdoor schooling arena thought it was highly amusing and to be fair Victoria did brilliantly to sit tight when it happened. The horse was fine, popped over a few more fences with Victoria afterwards and is my only runner on Saturday. Victoria also schooled Howlongisafoot before riding Join Together, the horse she plans to partner in point-to-points this winter. The idea is to give her as much practise as possible in the saddle in the coming months. She has already made a decent start on the flat with the help of Lawney Hill, is keen to progress and is definitely going the right way. It helps that Victoria knows she has plenty to learn. The more experience she gets riding different horses and the more mileage she can clock up the better it will be for her. I'm sorry to report that two horses who did brilliantly for us last winter are out for this season. Zarkandar excelled himself in landing a hugely valuable Grade 1 hurdle at Auteuil but he picked up an injury in April and was having an easy time before a Spring campaign. He hasn't made the progress we'd hoped, so we've decided to give him a year off. Caid Du Berlais was the star of the show in the Paddy Power Gold Cup, but he, too, will have time out after sustaining a minor leg injury. Both horses should be back in training in the autumn. We are lucky to have fresh recruits to step up when this happens and the recent arrival of six horses owned by Roger Brookhouse came at a timely moment. Roger is such an enthusiastic supporter of National Hunt racing and deserves lots of success for his considerable investment in the sport. Hopefully we can provide it for him. The six include The Ould Lad, Wuff, Stilletto and Stellar Notion. I am still learning about them and have yet to make any entries for them, so there are no plans for the moment. 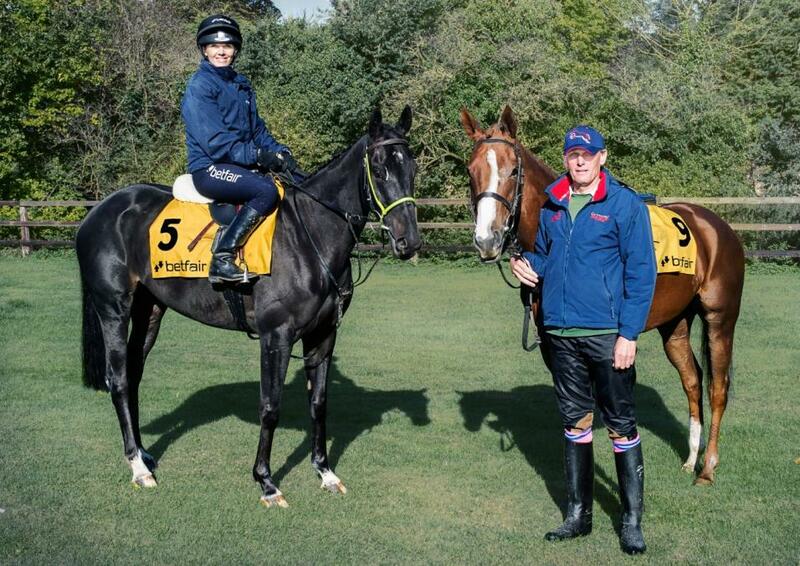 Seemed to enjoy joining forces with Victoria Pendleton on Thursday morning. He tends to need his first run of the season and improved enormously on a disappointing debut for us a year ago by beating the subsequent Grade 1 winner Whisper under a good ride from Nick Scholfield at Exeter on New Year's Day. He then fell heavily while schooling over fences at home in the Spring which meant he didn't get to run at the Cheltenham Festival. Although Ceasar Milan has had plenty of hard graft this autumn, including regular schooling over fences, he is such a stuffy horse he is sure to benefit considerably from his first race. He will have an entry in the Paddy Power Gold Cup at Cheltenham in November. A speedy type who relishes fast ground and scored twice for us from four starts last season as a hurdler and remains a novice until the end of this month. I did toy with the idea of sending him to Chepstow a week ago before deciding to keep him for this competitive Listed race at Kempton, a flat track that suits him well. He was only just beaten there by Bivouac on his debut for us in a decent juvenile hurdle last Christmas. He was quite free in his races in his first season but is a lot more relaxed in his work this time and a decent gallop will help him settle early on. He has done plenty at home so I am hopeful of a good run.